With the spectacular developments in technology accompanying and aiding scientific research over the past few decades, postgraduate students are often encouraged to focus more on generating data than to utilize their most sophisticated piece of equipment: their mind. 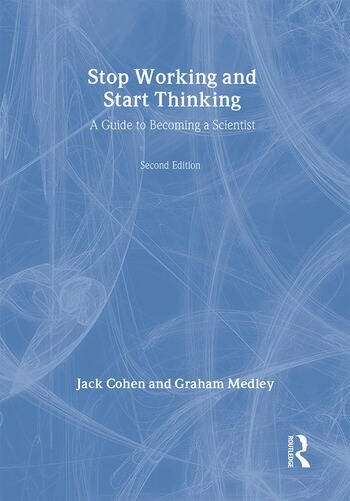 Stop Working & Start Thinking, Second Edition aims to encourage young researchers to think more clearly about their experiments, from experimental design to data interpretation. This new edition builds on the success of the first edition, with new material throughout and a new chapter on measurement interpretation, including an examination of cryptic assumptions. This book is essential reading for postgraduates who wish to put the mastery back into their M.Sc. and the philosophy back into their PhDs. 1. Preamble. 2. Introduction. 3. Science Like what It is Like. 4. How Scientists Work. 5. Observations, Examinations and Experiments. 6. What are you Measuring? 7. Thinking About your Measurements. 8. Interpreting your Measurements. 9. Kinds of Experiments. 10. Here's the Answer, What's the Question? 11. Content and Context. 12. Notes for Postgraduate Students. 13. Postamble.